Want to truly safeguard your family’s skin from the harmful effects of the sun? 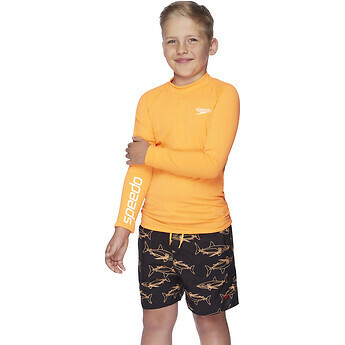 All Speedo sun tops are tested in line with rigorous Australian standards. Our Speedo Endurance+ fabric is twenty times more fade resistant than conventional elastane swimwear and the multi-directional stretch material offers greater freedom of movement. My kid looks nice in it. Tt drys fast and durable.